Against TTIP: Sinn Fein, Social Democrats, PBP/AAA, The Green Party, and the Workers Party are opposed to TTIP. Concerned regarding ISDS: FF and Labour have highlighted concerns re ISDS but are not totally opposed to TTIP. In Favour of TTIP: FG and Renua don’t seem to explicitly reference TTIP in their manifestos, but have expressed support for advancing it (re: previous FG policy statements & Renua tweet below). THE WORKERS PARTY: “The so-called Transatlantic Trade and Investment Partnership (TTIP) is currently being negotiated in total secrecy by the EU and the USA. If allowed to pass it will be one of the most dangerous and damaging events for workers and consumers on both sides of the Atlantic. TTIP aims to supersede the laws and economic regulations of individual states, and to punish those governments that fail to comply with the demands of international capital in courts staffed by corporate lawyers – the so-called Inter-State Dispute Resolution Mechanism. FIANNA FAIL: “Support a fair Transatlantic Trade and Investment Partnership (TTIP) agreement Fianna Fáil supports the principle of removing barriers to trade. This is essential for Ireland to be successful. However, we also believe that trade deals must be fair and must protect the position of states which aim to ensure high living and employment standards. An ambitious and comprehensive TTIP (Transatlantic Trade and Investment Partnership) agreement between the EU and United States has the potential to add up to 10,000 jobs to the Irish economy across a wide range of businesses. However there are a number of issues that cannot be compromised around food standards and investor-state-dispute-settlement (ISDS) mechanisms to protect Irish interests before full support can be given. We will: – Defend and ensure that EU standards are not up for negotiation. In particular, we recognise the importance of maintaining the high standard of food safety in Europe. Fianna Fáil will only support a TTIP deal which fully upholds food safety standards to the highest levels. 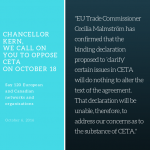 – Work at an EU level to reform the ISDS proposals.